I say: fried pizza. You say: overkill. But then I say: delicately crispy exterior, softest chewy insides, glamorously golden brown, ZERO percent greasy. And you say: actually, changed my mind. Welcome to the life-changing method of crispy-frying your pizzas! I’m honored to be a part of your journey. I absolutely mean it when I say that frying your pizzas is a life-changing experience. I ate fried pizza for the first time back in 2015 when I went on a trip with DeLallo (who I am in a very delicious long-term relationship with, as you can see). My friend Heidi blogged about the fried pizza experience here and actually, if you scroll down on that post, you can see a picture of me taking a picture of fried pizza! Yep. That’s me. THINGS HAVE COME FULL CIRCLE, FRIENDS. Most of us don’t have wood-fired pizza ovens at our house, which is why I would like to argue that this method is really THE BEST way to make a light, crispy, airy, but still somehow soft and chewy pizza crust in the humble confines of your own kitchen. So let’s talk it through. We start with a DeLallo pizza crust kit. They’re just super easy and super good. Precise amount of yeast, authentic Tipo 00 flour, the whole deal. Once the dough is mixed and puffed up nicely, we flatten it into little pizzas (I like to go for more of a personal pan size here) and we fry in a little bit of oil. Just about a minute is all you need. And then we flip and repeat. And now our pizzas taste like golden, crispy heaven. To pizza-ify, we top with sauce and cheese and bake in a hot oven until melted and bubbly. If we are fancy (WE ARE), we finish with pesto, fresh basil, red pepper, Parm, the works. You guys, if you have never tried this, it’s time to give it a shot. It’s not greasy, it’s not overbearing, it’s not reminiscent of fair food. It’s just EASY pizza crust perfection. Crispy fried pizzas that are light, airy, and the perfect combination of crispy/chewy. It is the ABSOLUTE BEST way to make amazing, restaurant-level pizza at home! Make the dough: Make the pizza dough according to package directions. Let the dough rise (for DeLallo pizza dough, the rise time is 45 minutes). Shape the dough: Divide the pizza dough into 6 sections. Roll each into a ball and flatten into a pizza shape (mine were about 6-8 inches in diameter and about 1/2 inch thick around the outside). Prep the oil: Heat a large cast iron skillet with oil (about 1 inch deep). Turn the heat to medium/low. Test the oil by dropping a speck of water in it – when it sizzles or bubbles, then the oil is ready. Fry the pizza dough: Working one at a time, gently place the pizzas into the oil and fry for 30 seconds to 1 minute until light golden brown. Flip with tongs and repeat on the other side. Transfer to a paper towel lined pan to cool. Finish in the oven: Preheat the oven to 450 degrees. Spread each pizza with sauce, cheese, and any other toppings you want. Bake for 5-10 minutes or until the cheese is melted. Top with fresh basil, pesto, or anything else you want and serve warm. And then enjoy those puffy, crispy, personal-pan-sized bites of pizza crust! YUMMMMM. As the oil got hotter, I found that the middle of the dough wanted to puff up. I just used a slotted spoon to gently press in the center while frying and that helped to keep the shape generally flat. You can also try poking holes in the pizza crust to help with this. If your pizza dough is turning deep golden brown, your oil is too hot. Turn it down and let it cool for a few minutes before frying your next one! The pizza dough should be fully cooked when it comes out of the oil, so if you cannot resist the golden crispy hot fried bread thing going on (I could not), you might enjoy sacrificing one or two fried pizza crusts to dip in sauce as an appetizer. YUM. Can I come to dinner club, just this once? 😉 Seriously, though, I was just re-reading Shauna last night and was re-inspired to actually start a dinner club of my own. I’ve been thinking about it for forever. 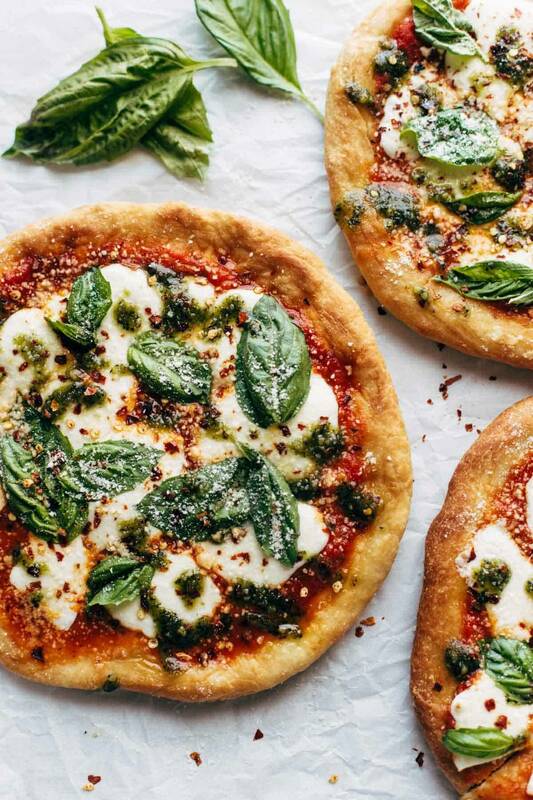 These pizza ideas sound incredible. Also, I made the lemon blueberry bread and it was heavenly. I used the tiny wild Maine blueberries. OMG I don’t even know where to start! Between that amazing looking crust, or all of those different topping ideas! That crust seriously looks good enough to eat on its own! We make pizzas at home – from scratch… no yeast, use yoghurt in the dough. They turn out so good that we hate ordering pizzas elsewhere. Frying the pizza dough should be interesting, and reminds me very much of a kind of khachapuri (traditional Georgian bread filled with cheese) that we came across in our Georgia trip recently – where the dough was fried, with the unusual filling of beetroot leaves and cheese inside. We could try using this technique and top it up with the beetroot leaves and cheese, inspired by the Georgian Pkhlovana Khachapuri! Can’t wait to try this! 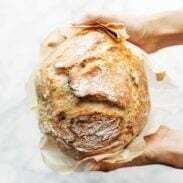 Would you mind sharing your homemade version of your DIY pizza dough with no yeast? Thank you so much! Something good to make when you want pizza, but don’t want to heat the house with the oven during the summer days. Love this! holy yum! I haven’t make pizza in a skillet before. These look amazing! What oil do you recommend for the frying? I have done this with frozen brrad dough to make what we call scones and navajo tacos. The fried dough is crazy good with honey butter. I cannot now believe I never thought to make pizzas with them before! Genius! These will definitely be made soon! Game changer! We’re big fans of grilling our homemade pizza outside, but as we live in the frozen north and are coming around to the realization that we’ll never see the sun or grass again, frying pizza may become our go-to. Adaptation is the key to survival. Thank you! What oil do you suggest for the frying? We used canola/vegetable oil! Olive oil could work too, but it can’t tolerate quite as high of heat. 1981, I was living in Geraldton and I came across Sophie Loren’s Neopolitan pizzas, very similar to yours except everything goes on table, homemade sauce, chopped garlic, grated Parmesan, fresh mozzarella and chopped basil. Everyone helps themselves. When ever anyone’s birthday or family gatherings this is the only request. This looks incredible!! I am most definitely going to check my local grocery for the dough kit. I’ve been craving pizza and this looks so much better than any fast food pizza I can find around here. Hope you enjoy it, Amanda! Life.Changing. This may be the greatest thing to ever happen to pizza! You had me at “crispy fried.” We love making pizza at my house, and have never tried this. I can’t wait to make this! wow, after this time immersed in pizzas and even a fair share of pizza recipes, I’ve never heard of this crispy fried pizza, and that’s after checking out dessert pizzas, crustless pizzas and other exotics, so very interesting recipe/ingredient introduction for me, thank you! Hope you enjoy it, Sabrina! I-need-this-in-my-life!!!! Oh my goodness! This is perfect for me! I am a huge pizza buff and I have got to give this a shot soon! BIG longtime fan of your blog and recipes, Lindsay, and love reading comments of your fans and fellow bloggers! As a “Native American” we know this recipe as Indian Fry Bread (without the Italian toppings) so do your research, peeps, and you’re welcome. How do I sign up for your food blog (recipes)? Where do you buy these delicious-looking pizza dough kits? Yeah, this looks crispy.. Will try this one. Thanks for sharing..
Fried Pizza!! Ah I first tried it in Naples, Italy- our taxi driver suggested we have some and I thought he was having a laugh but he insisted. It was sooo good! I love that you have a recipe here for it, gotta get the girls from that trip together and make this!